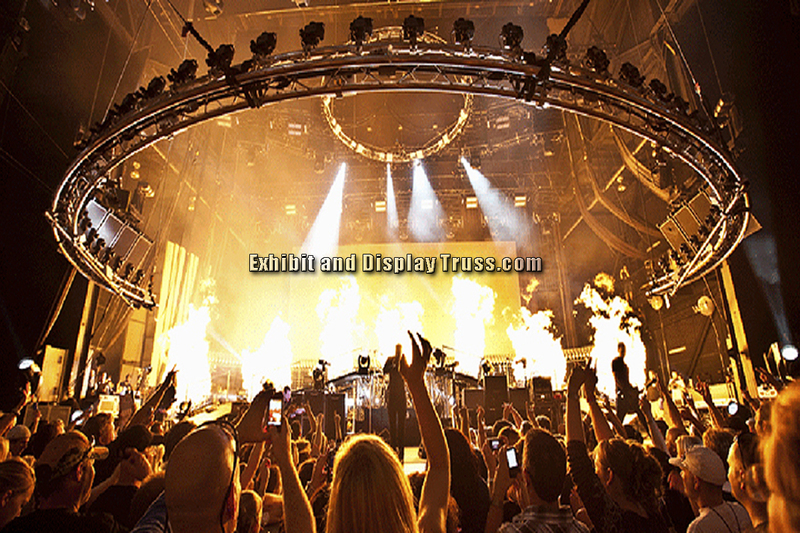 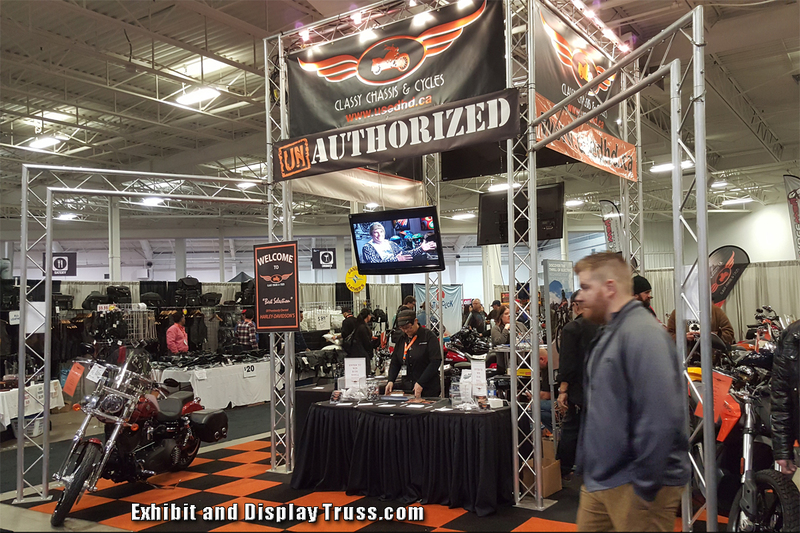 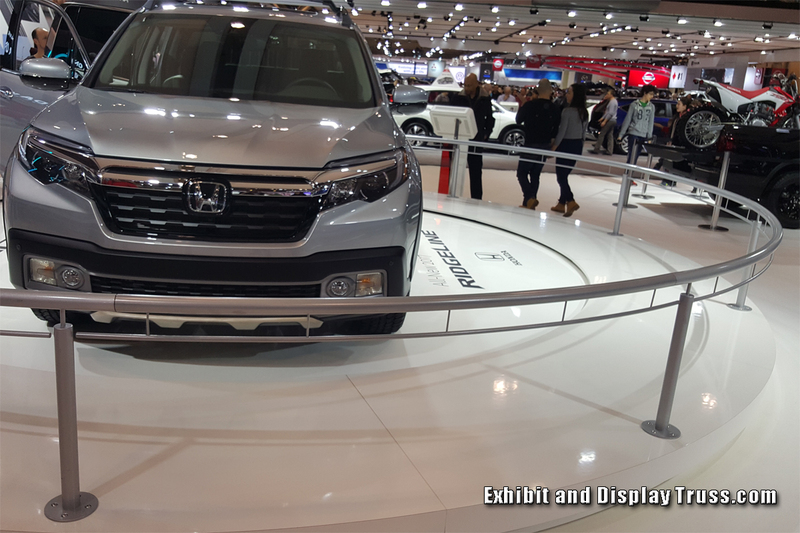 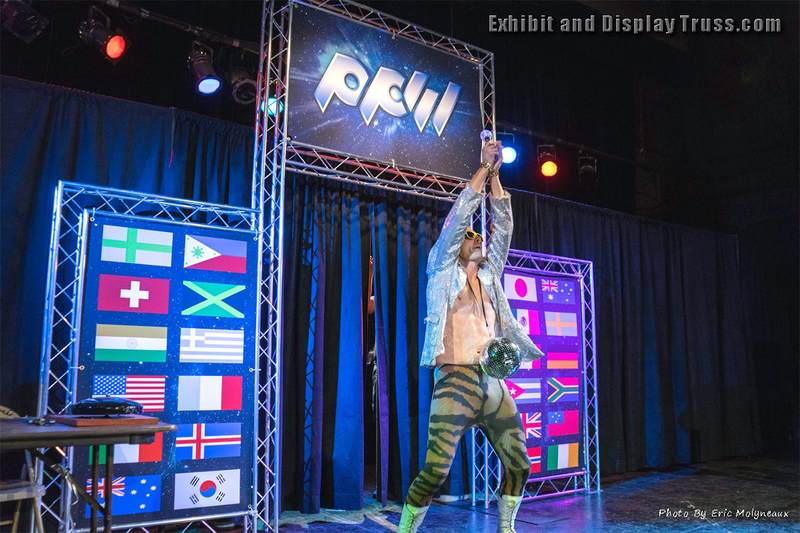 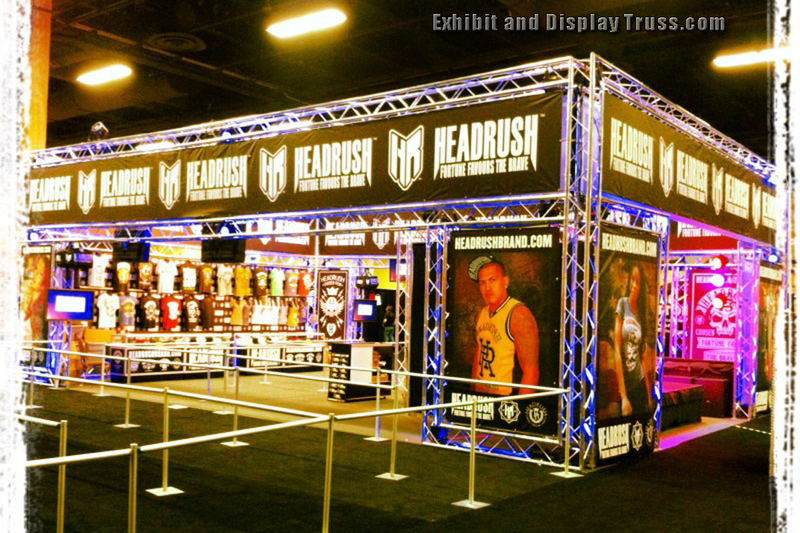 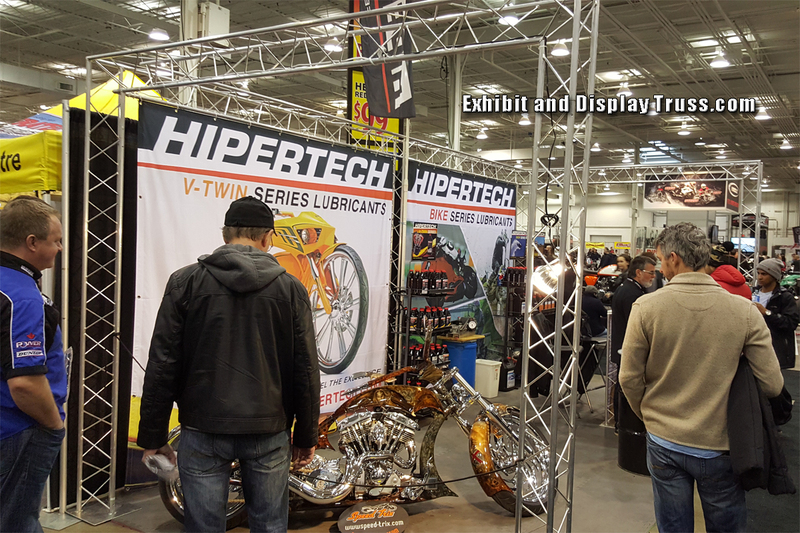 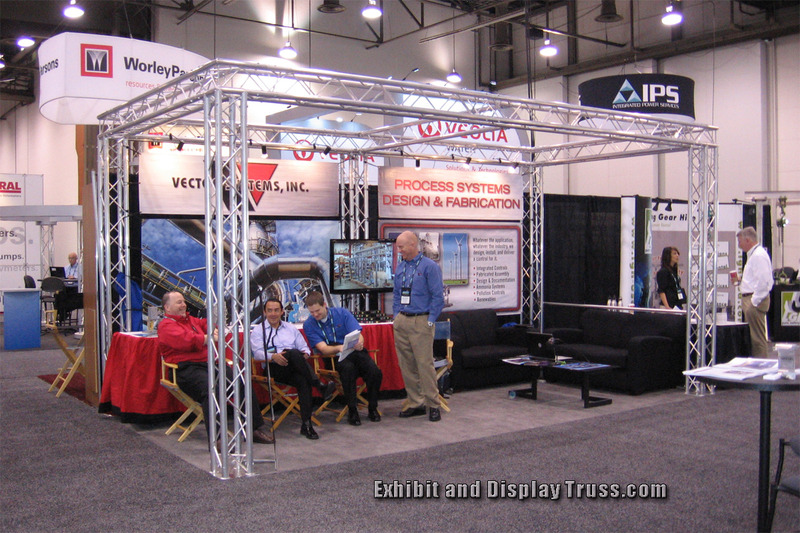 Exhibition exhibits and displays from Exhibit and Display Truss have proven to be some of the most exciting and value packed aluminum truss booths in the Nation. 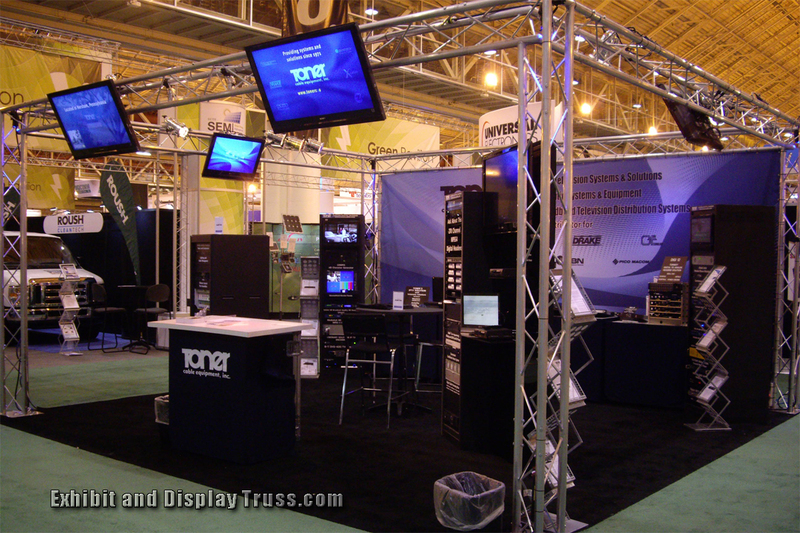 Displays for convention halls and conventions are commonly fabricated with our high quality, light weight aluminum trussing. 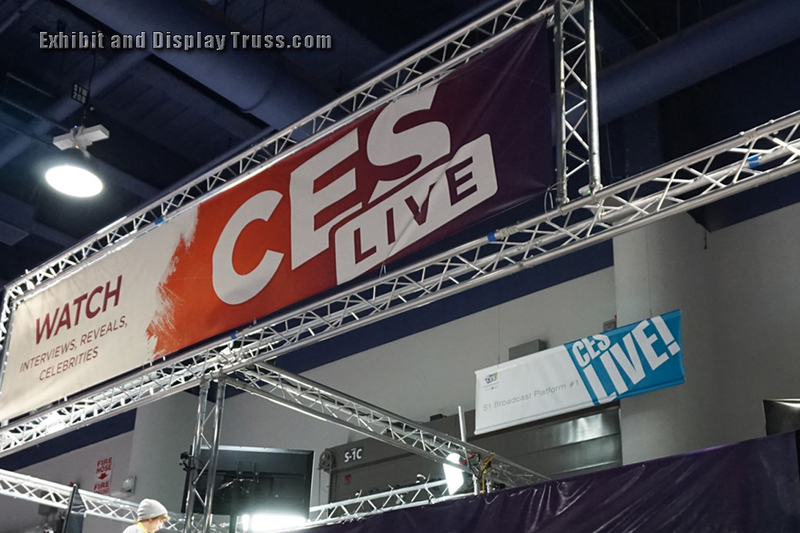 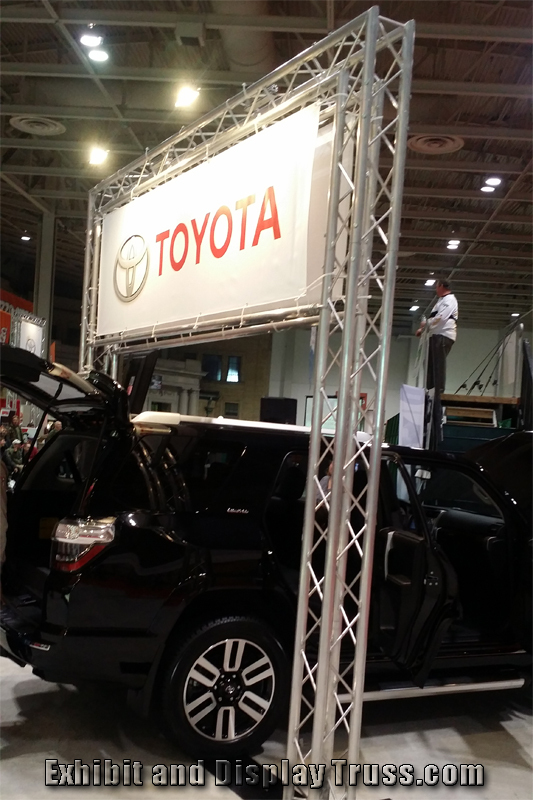 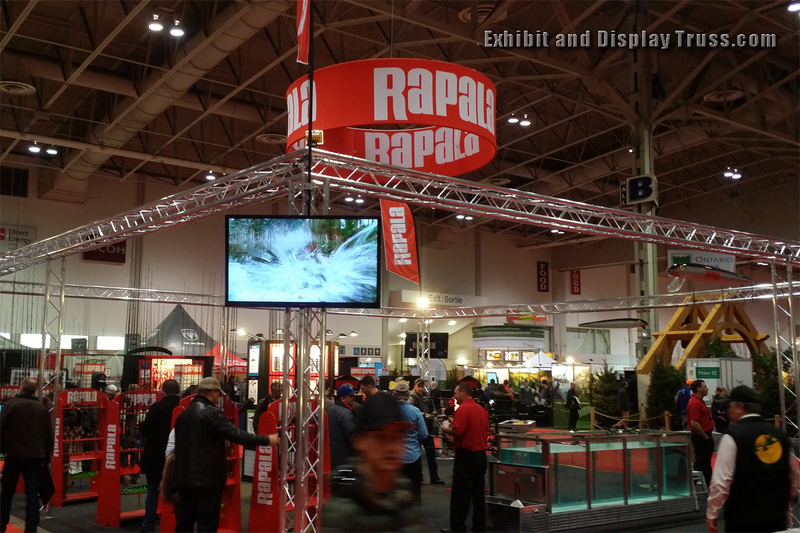 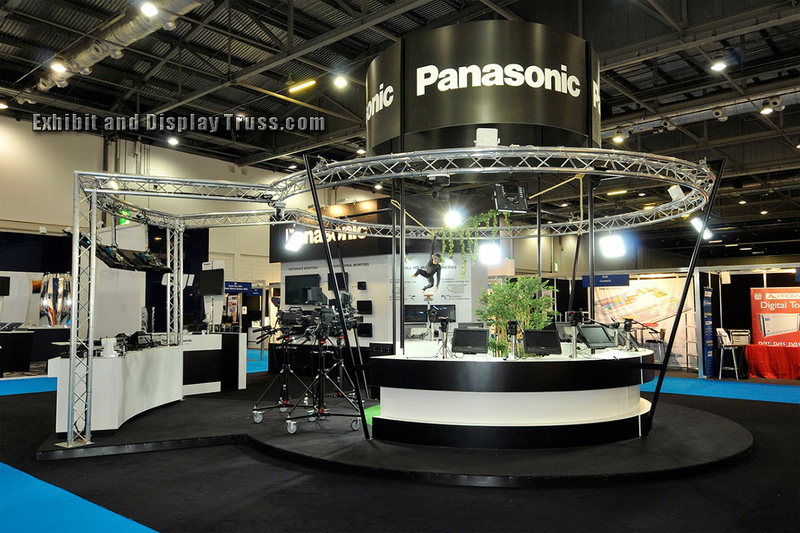 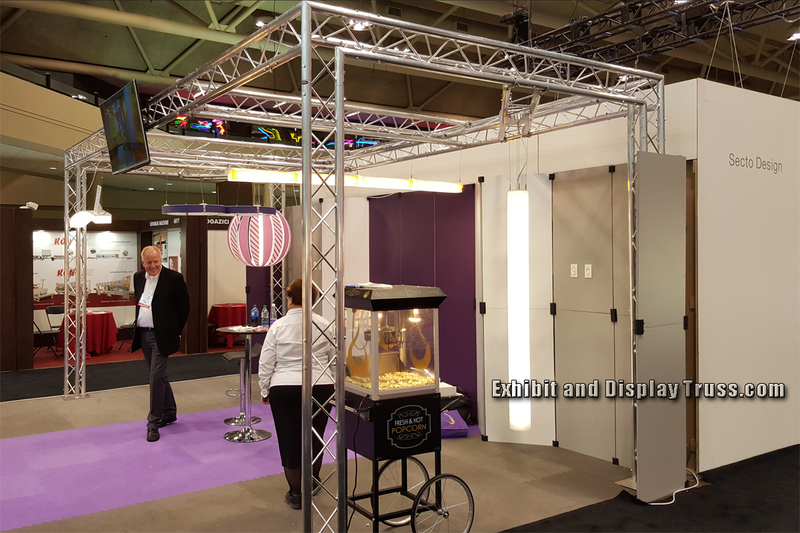 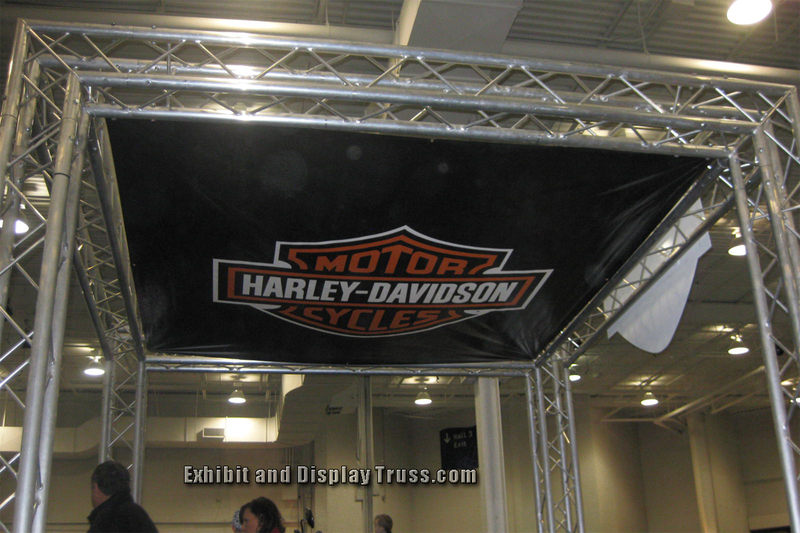 Browse through some fantastic uses of aluminum truss for trade show displays and exhibits. 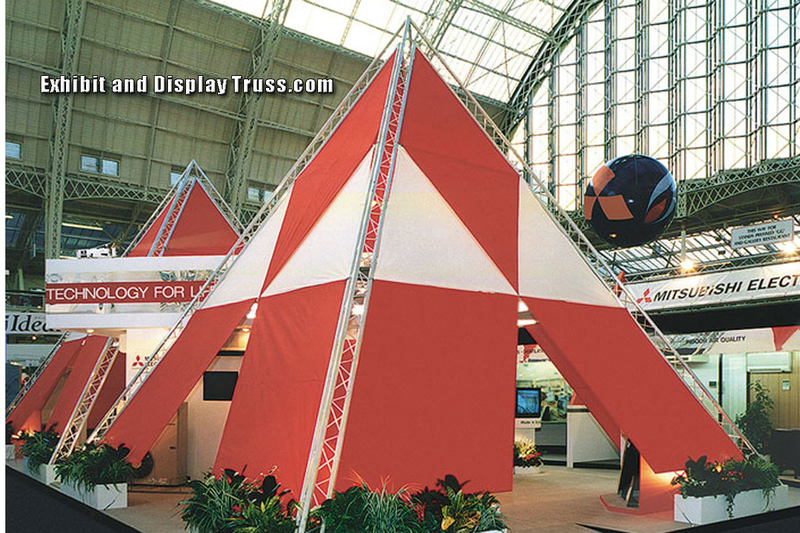 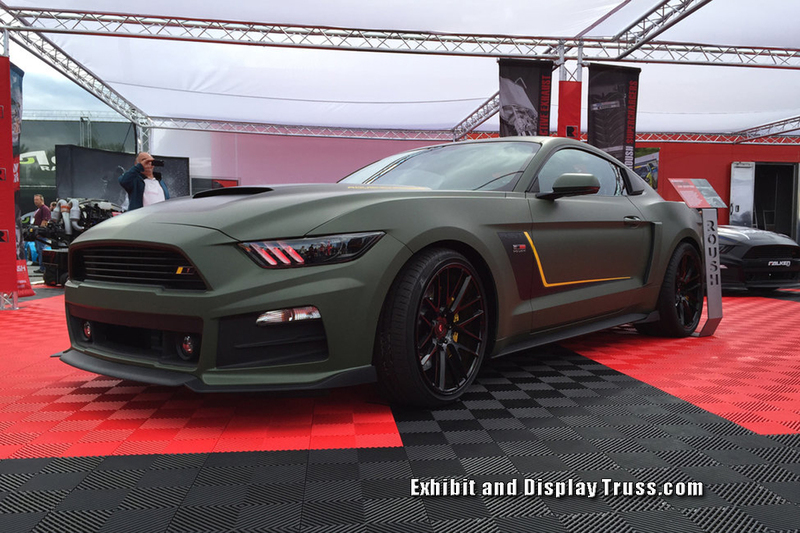 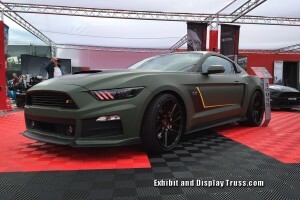 EDT trussing has been used in almost every industry and used to create stunning visual exhibits, displays and installations across the USA and Canada. 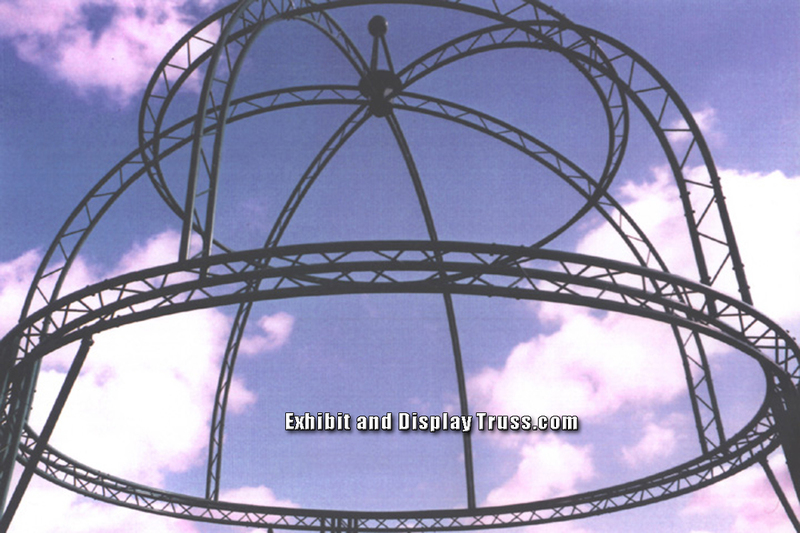 Exhibit and Display Truss aluminum trussing products are strong, light weigh and most of all attractive and exceptional value. 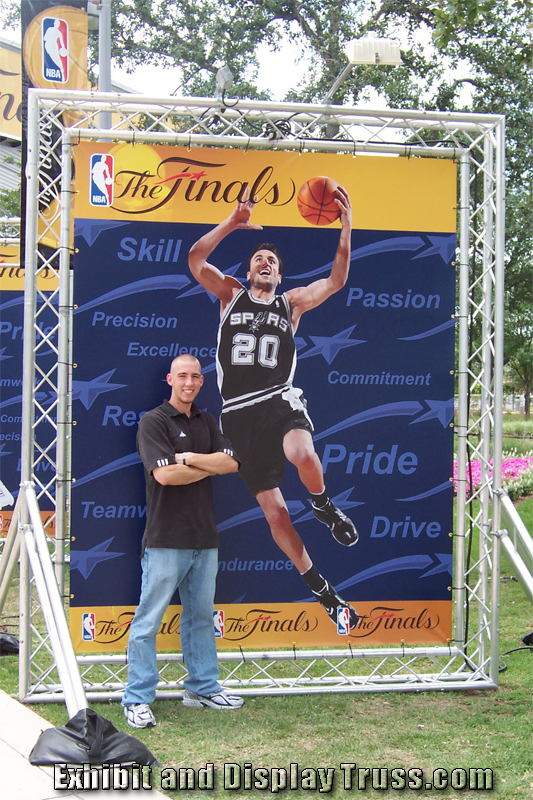 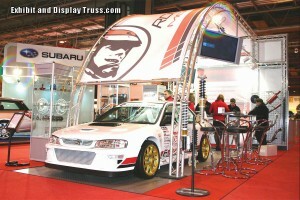 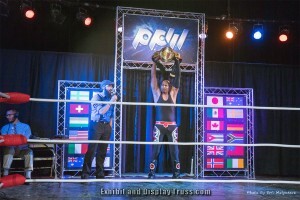 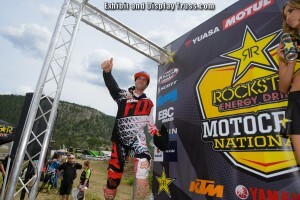 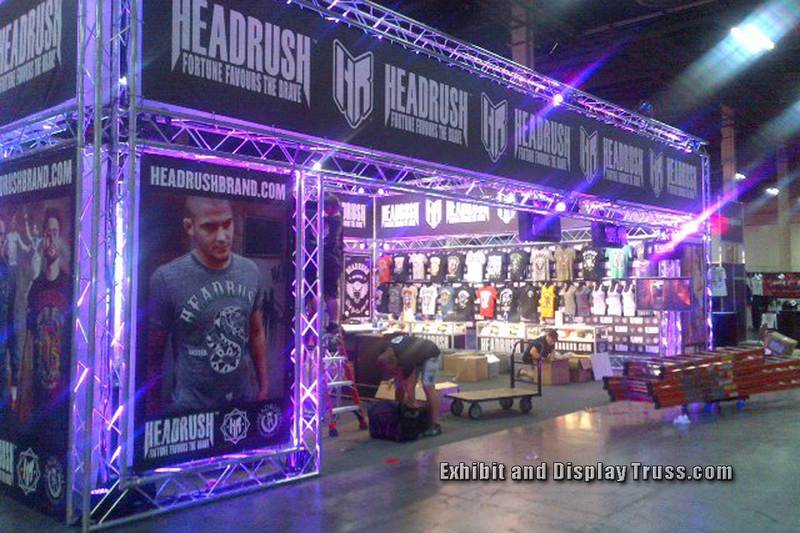 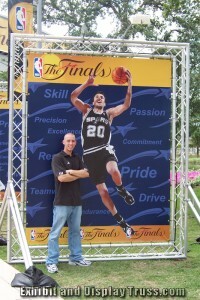 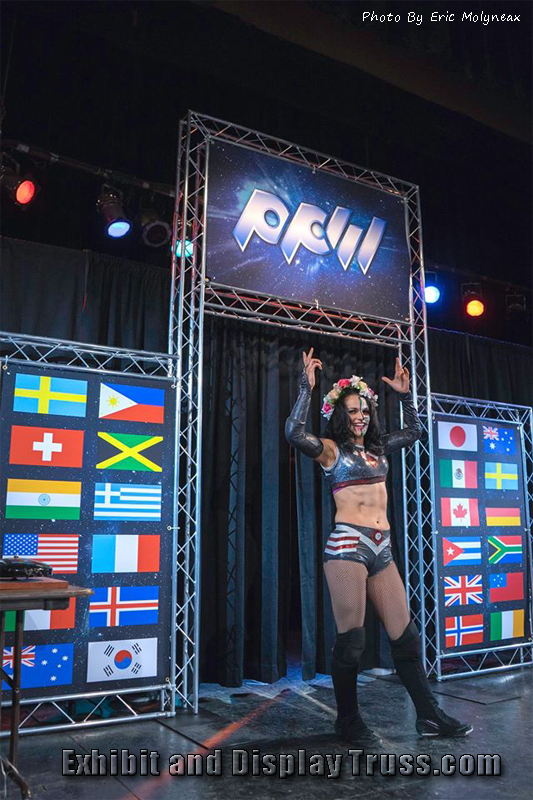 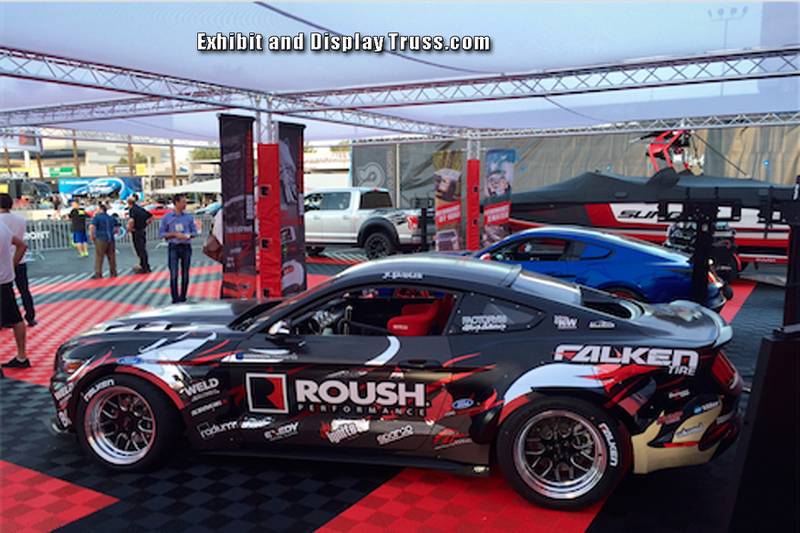 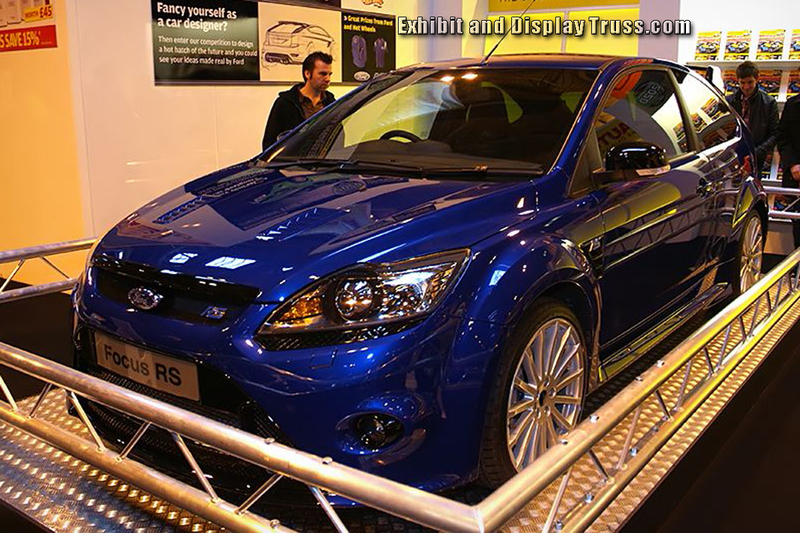 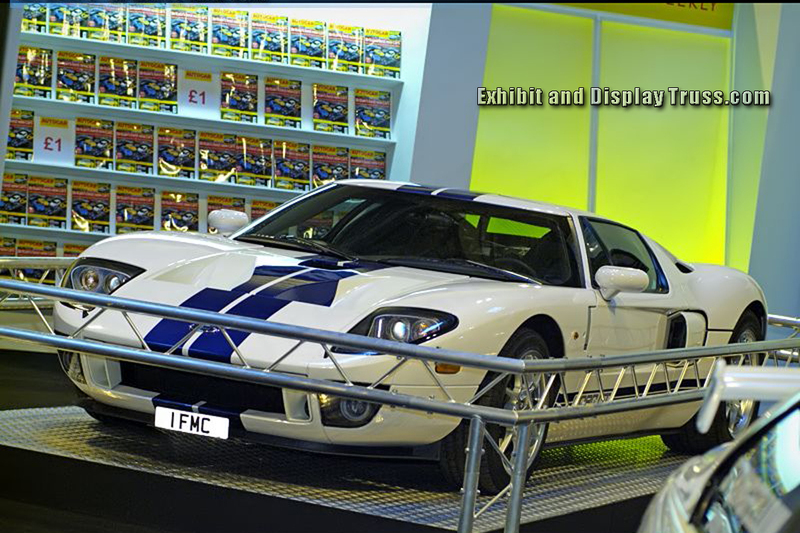 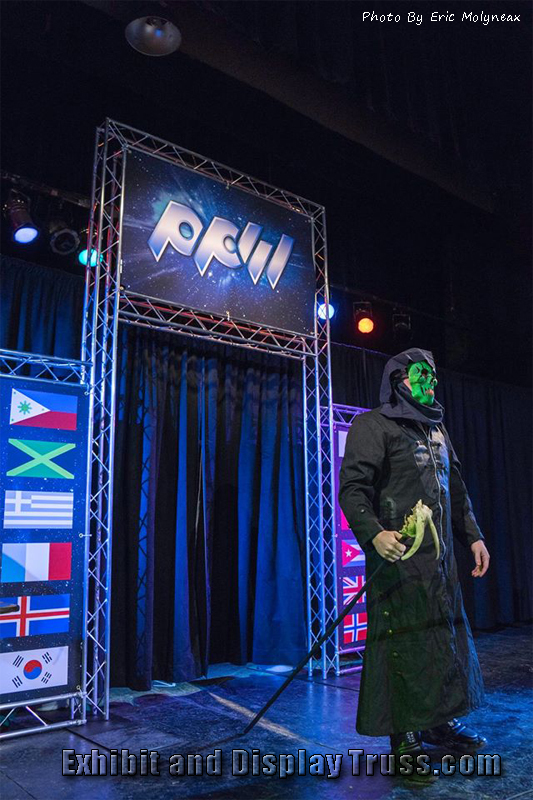 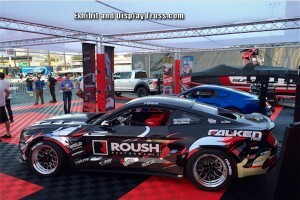 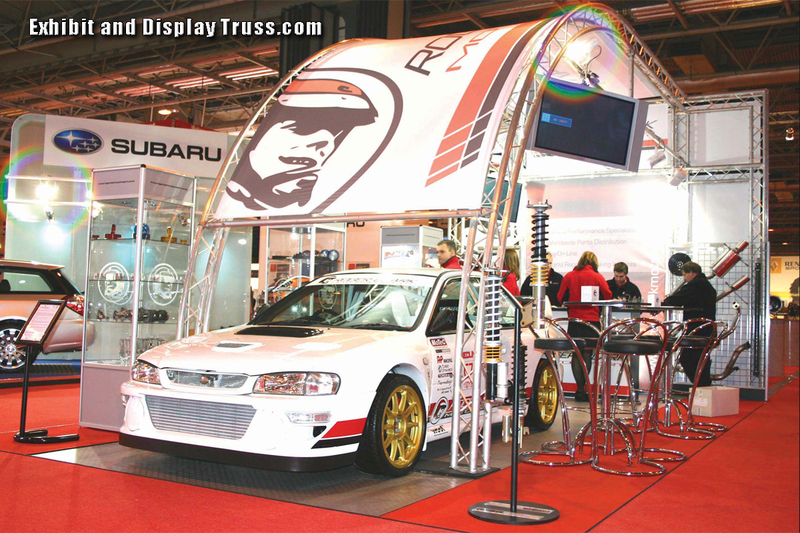 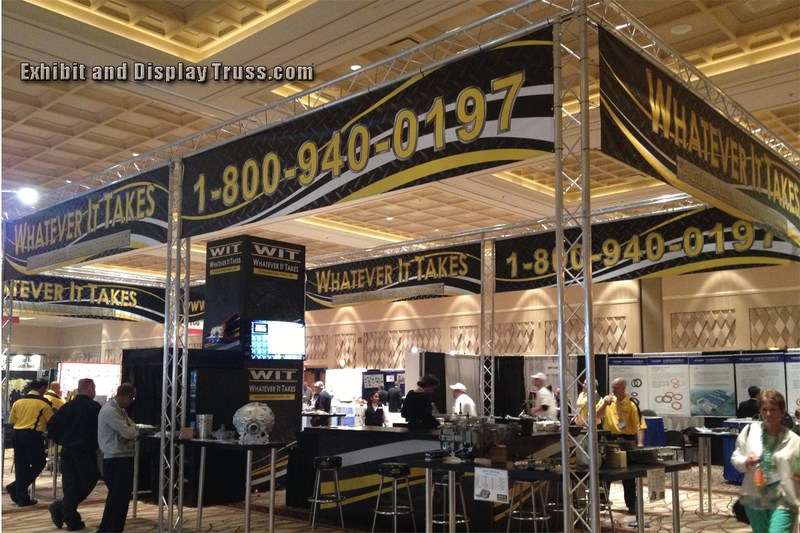 In partnership with Exhibit and Display Truss we can custom make anything you like, fast and at no extra charge. 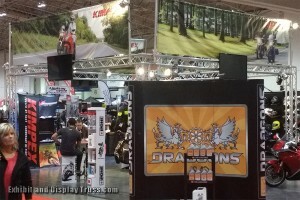 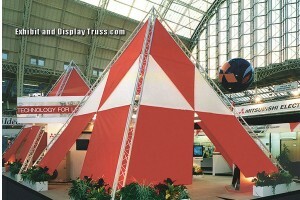 Your convention and more importantly your exhibition display booth must make an impact and stand out from the rest. 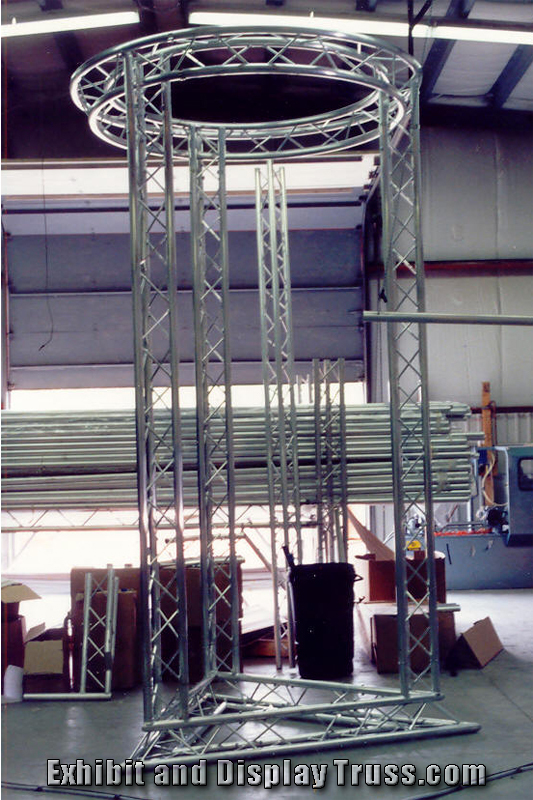 Don’t settle for an off the shelf package or truss kit from an offshore importer when we can custom manufacture and or fabricate any shape , size or style truss display structure you like. 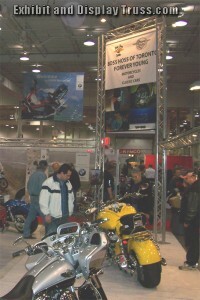 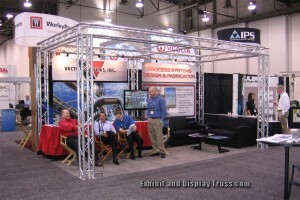 Convention hall exhibit booths that are cost effective and value packed with several profile sizes to choose from. 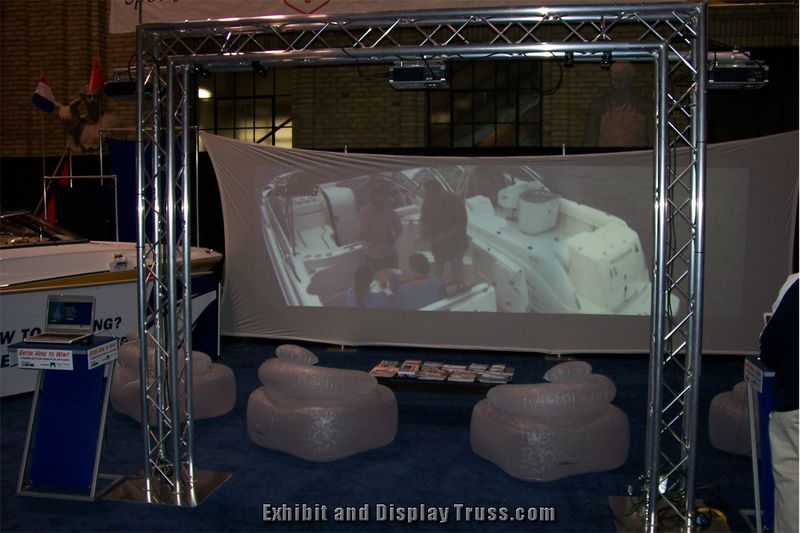 It’s almost impossible not to get the perfect piece for your next project or exhibition display booth. 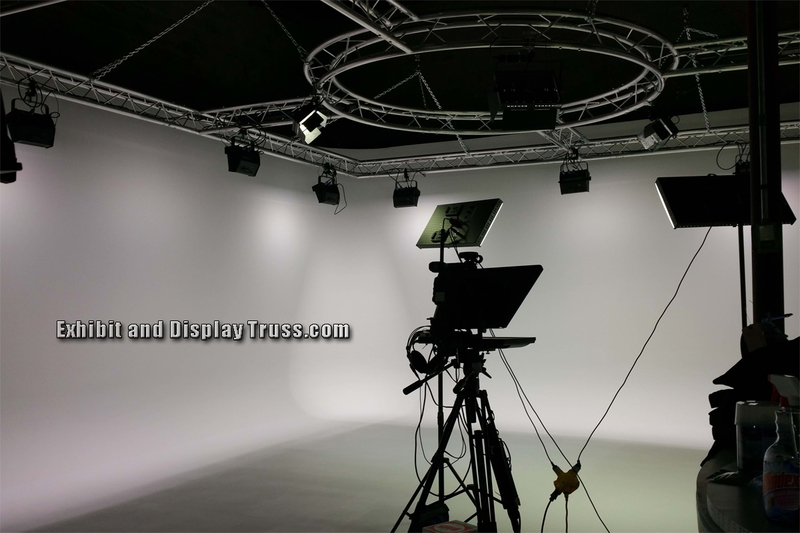 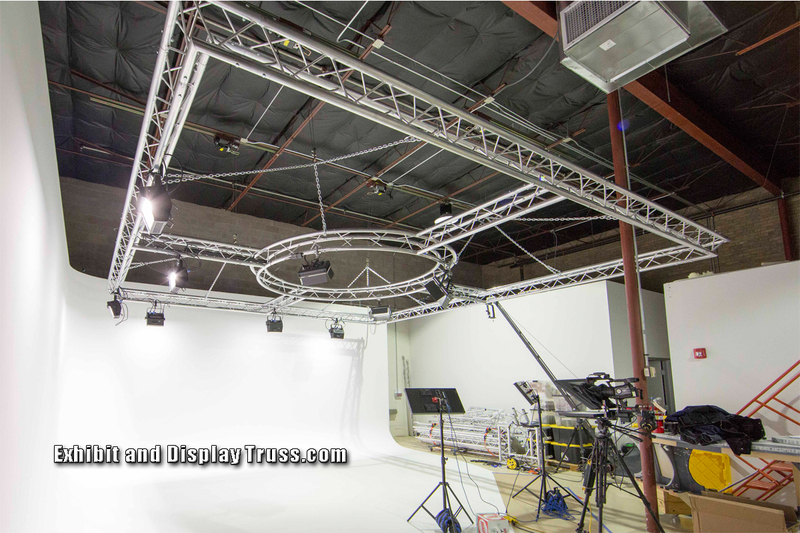 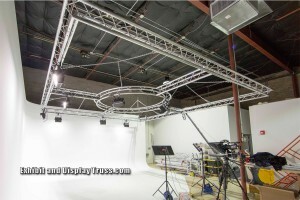 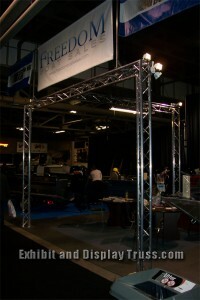 Let one of our experienced staff work with you to help you identify the best truss for your needs. 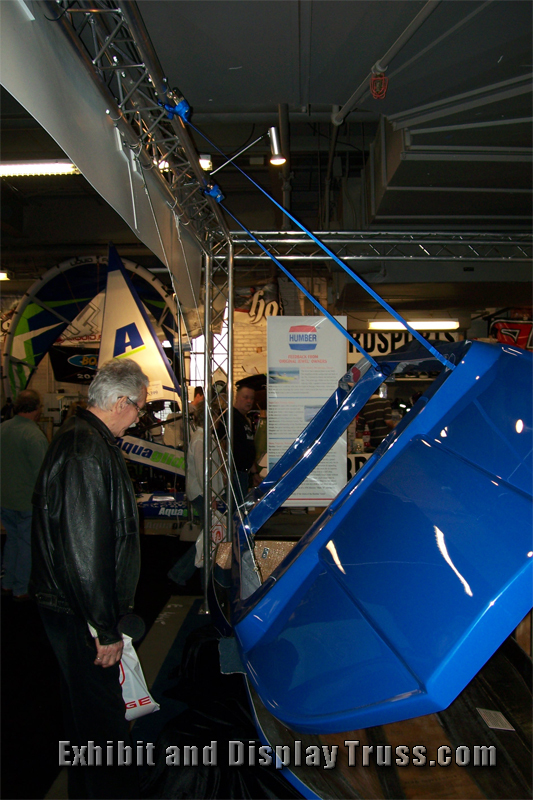 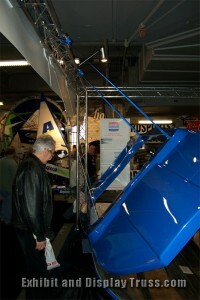 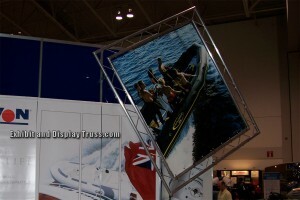 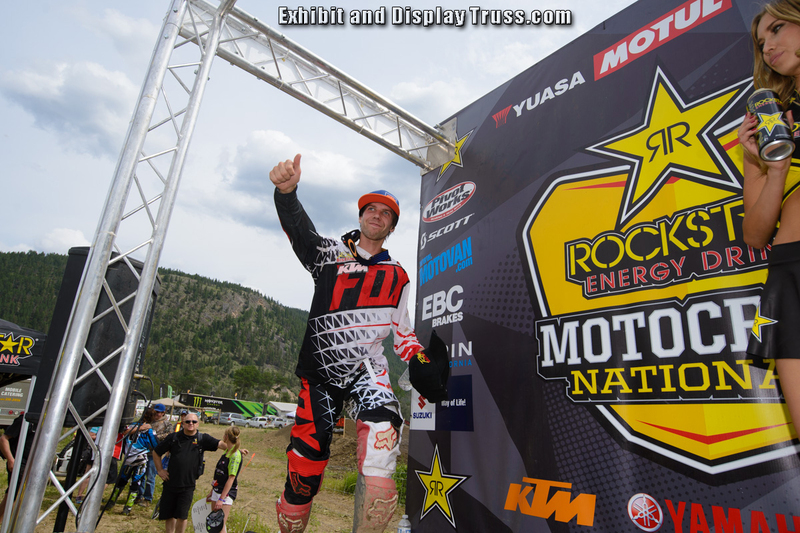 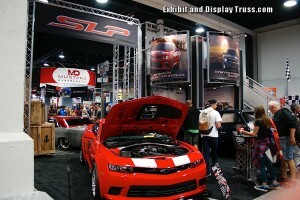 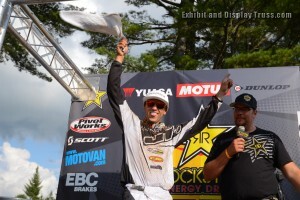 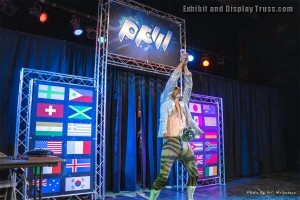 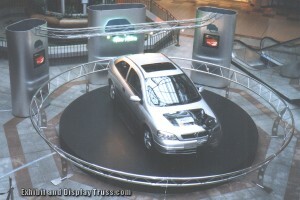 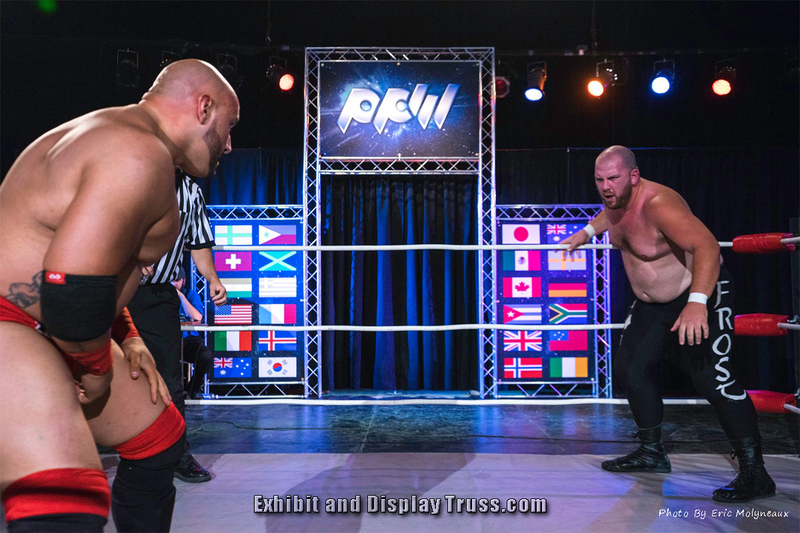 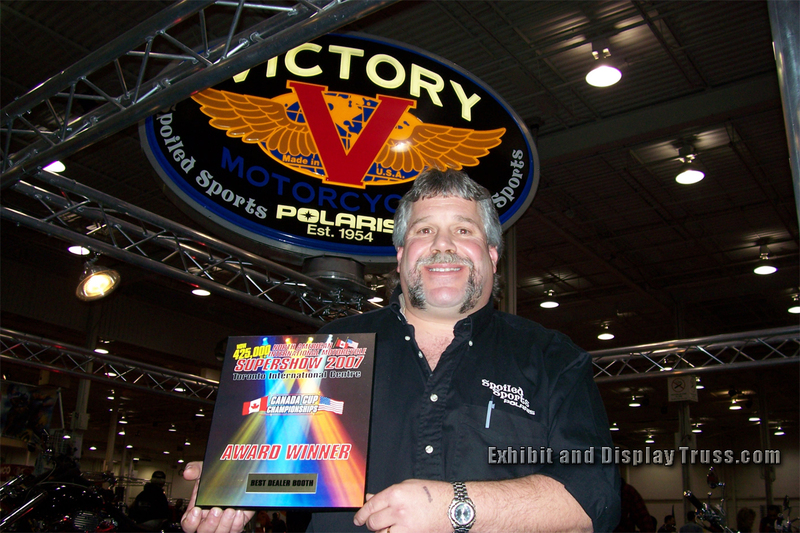 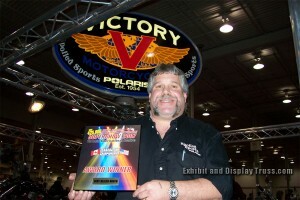 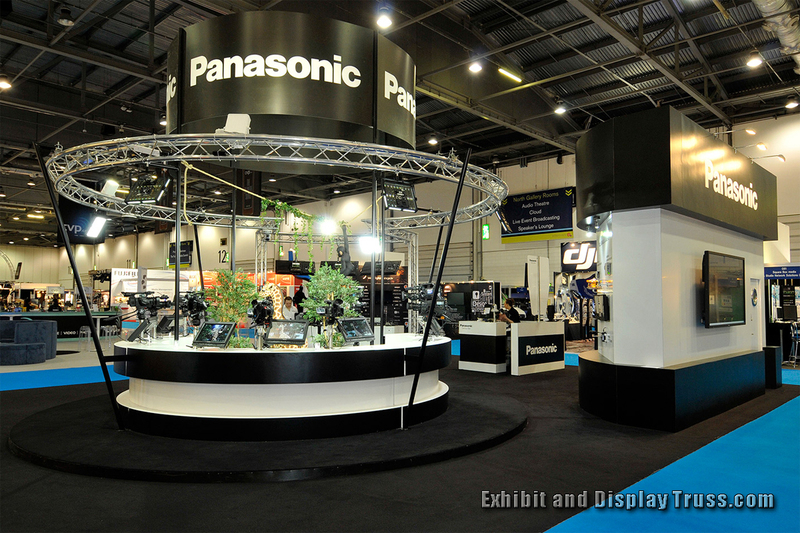 The best trussing display or exhibits are often designed by selecting “The Right Stuff”. 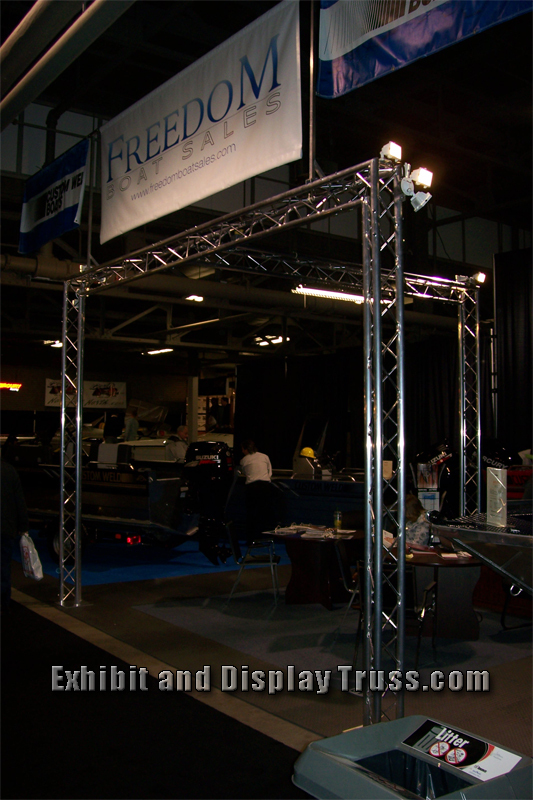 This simply means choosing one of our high quality aluminum trussing products that are not to heavy or not too large. 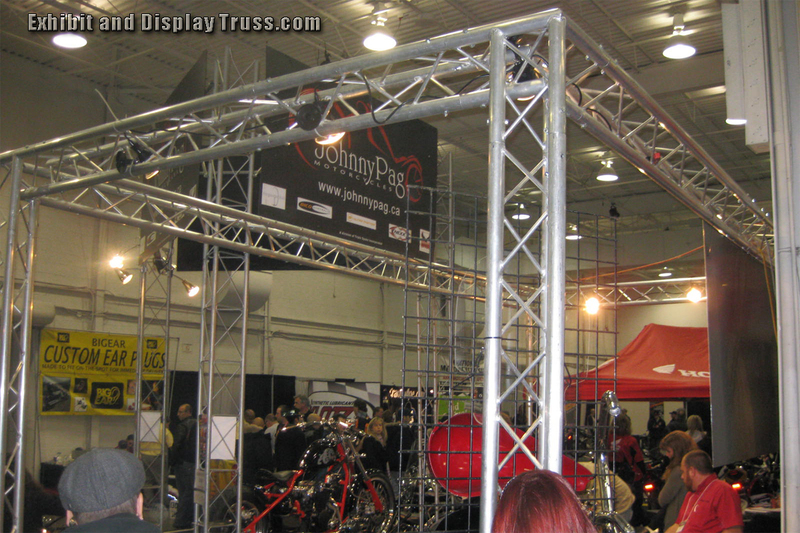 Don’t be fooled, steel trussing is often disguised as truss by other suppliers and it leaves customers disappointed and upset with their purchase or rental. We fabricate aluminum truss. 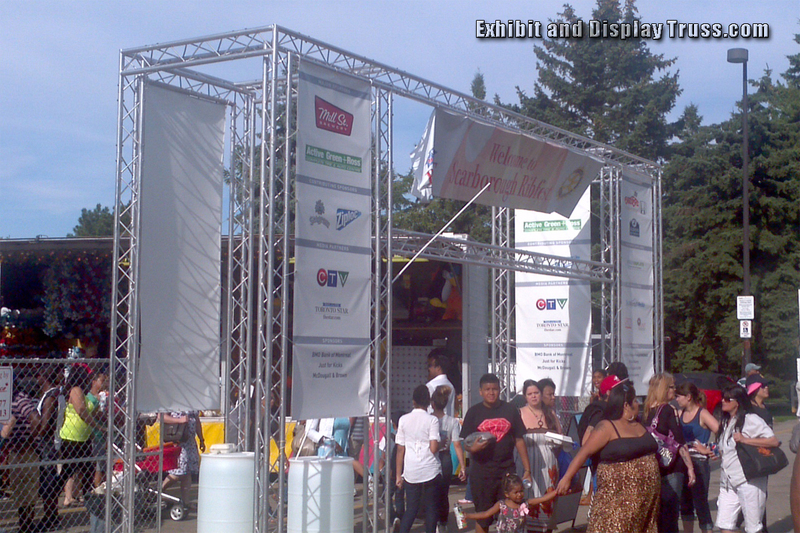 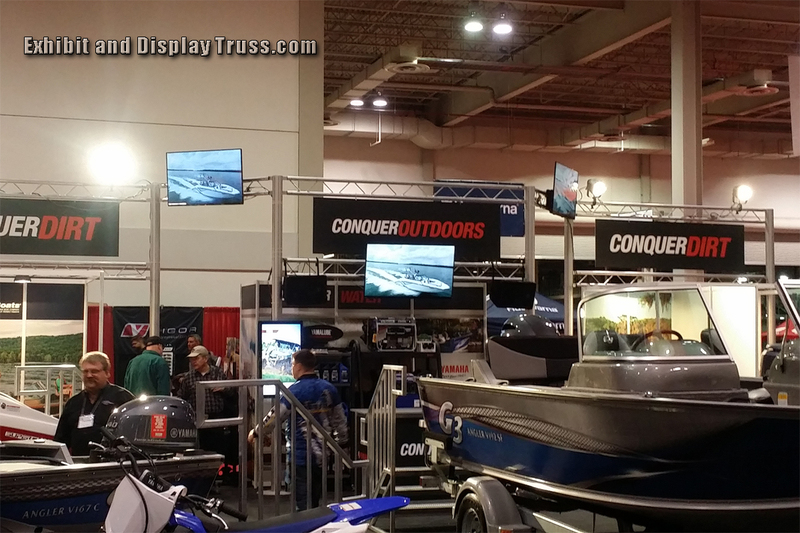 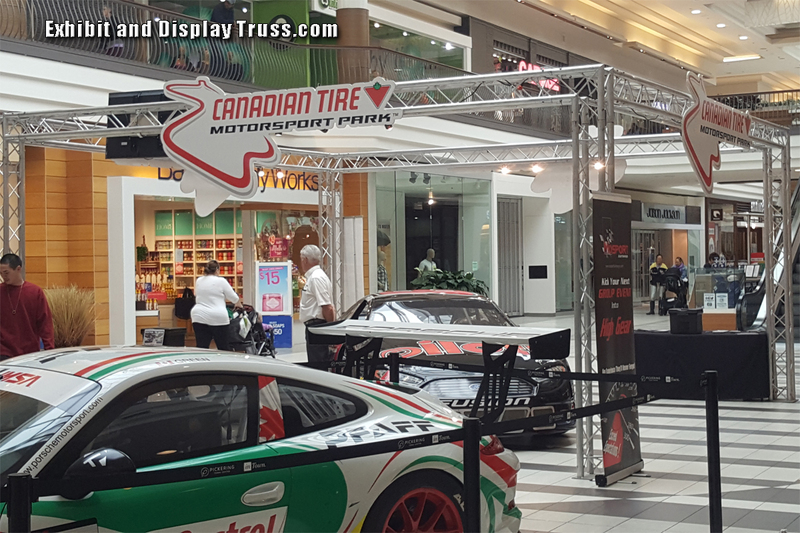 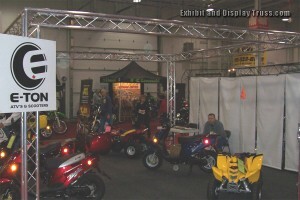 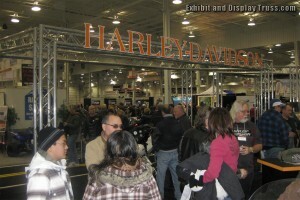 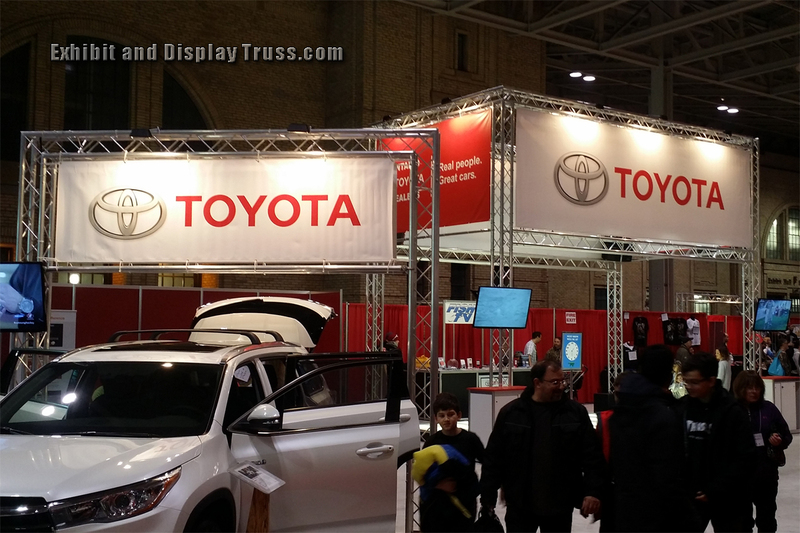 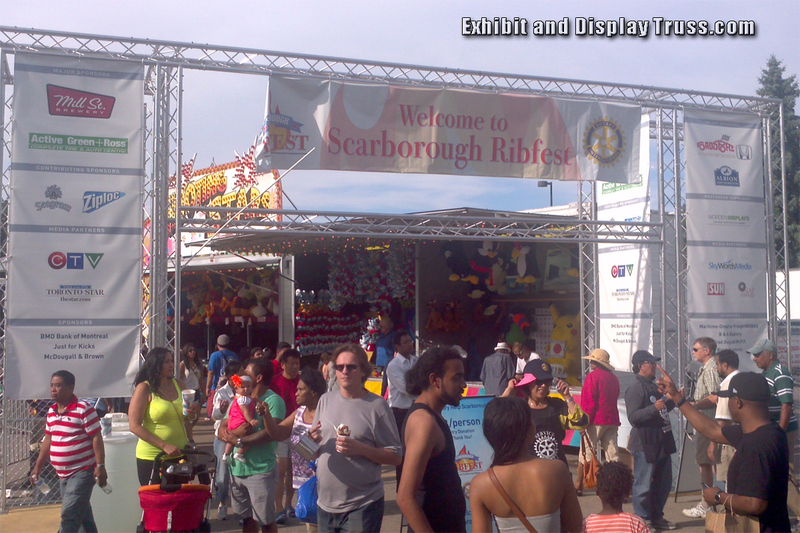 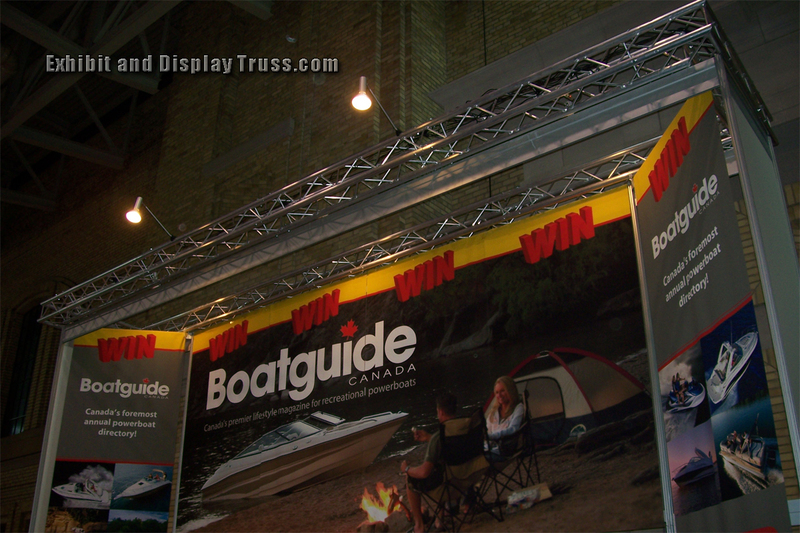 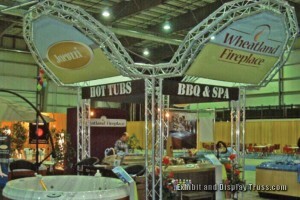 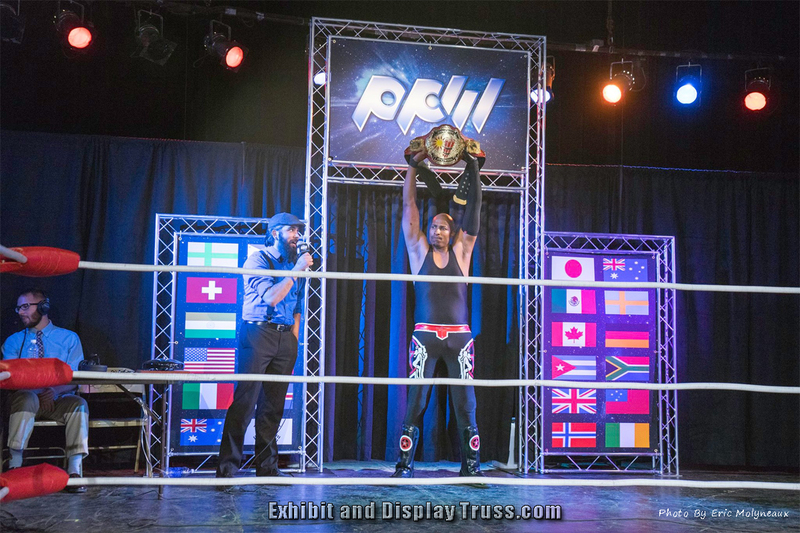 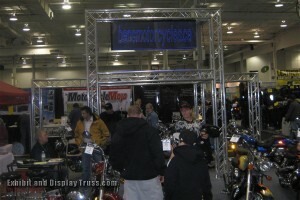 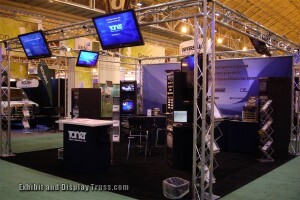 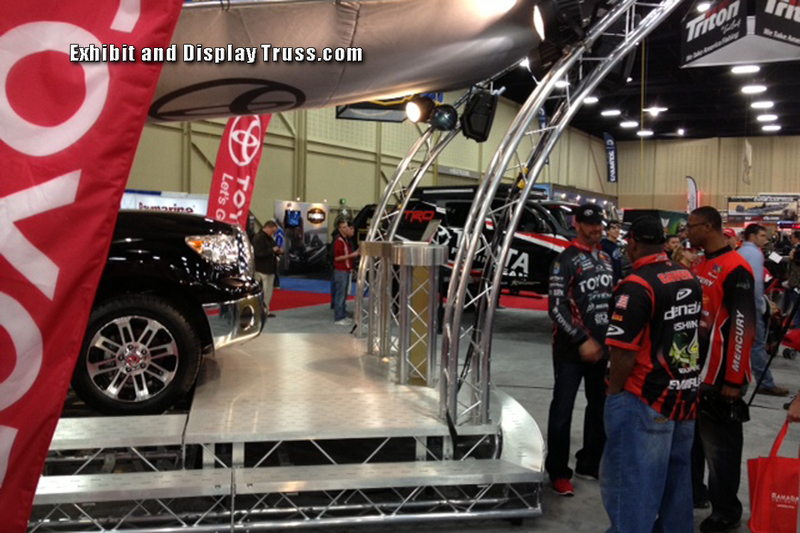 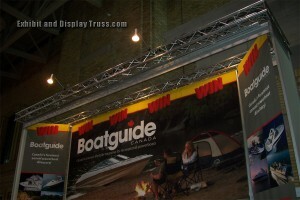 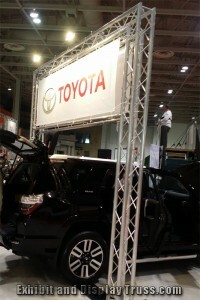 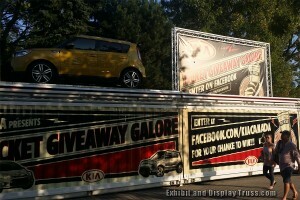 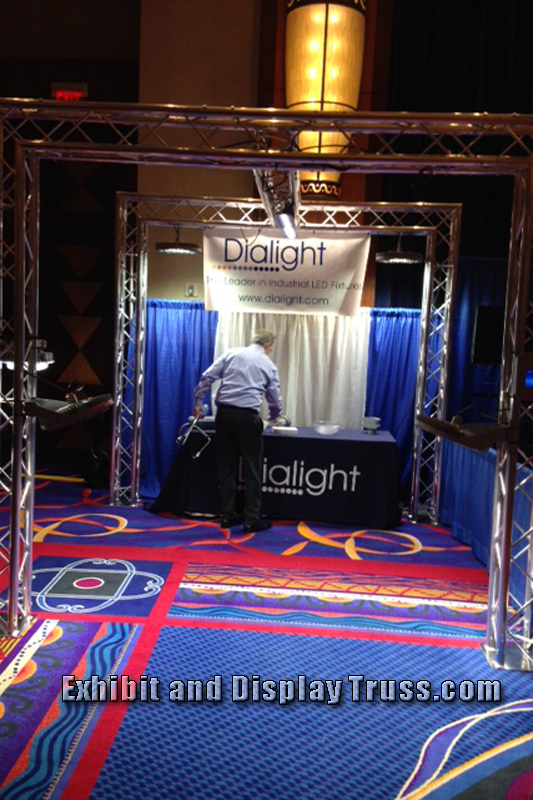 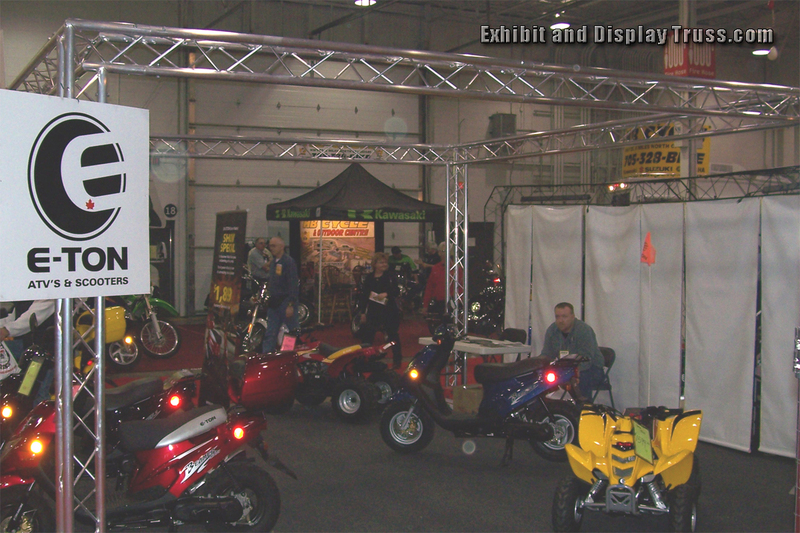 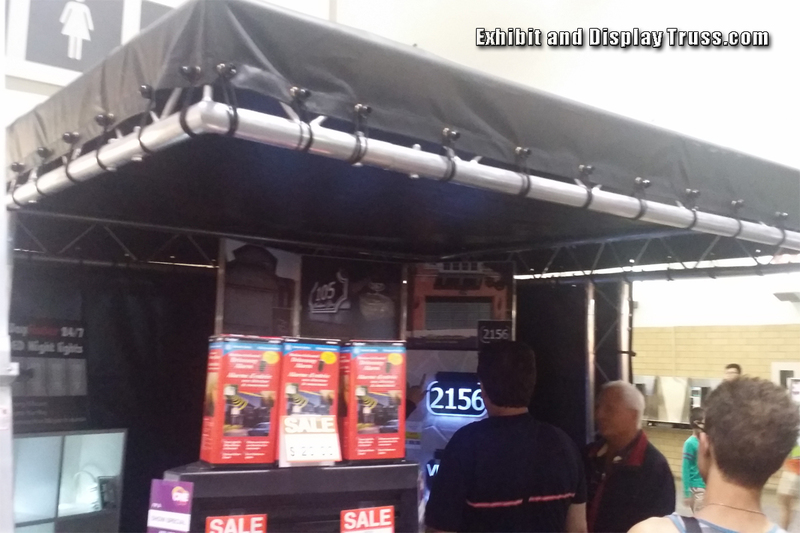 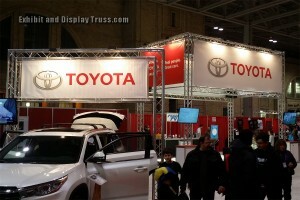 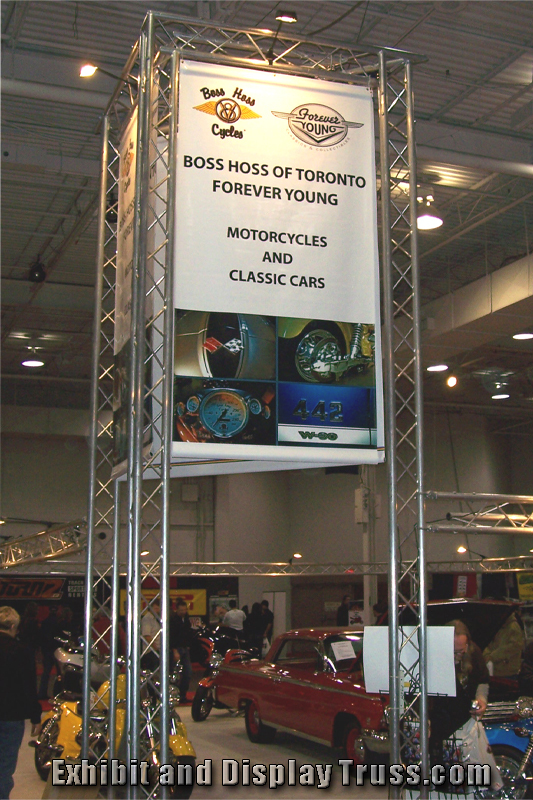 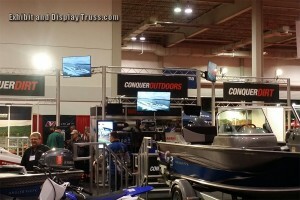 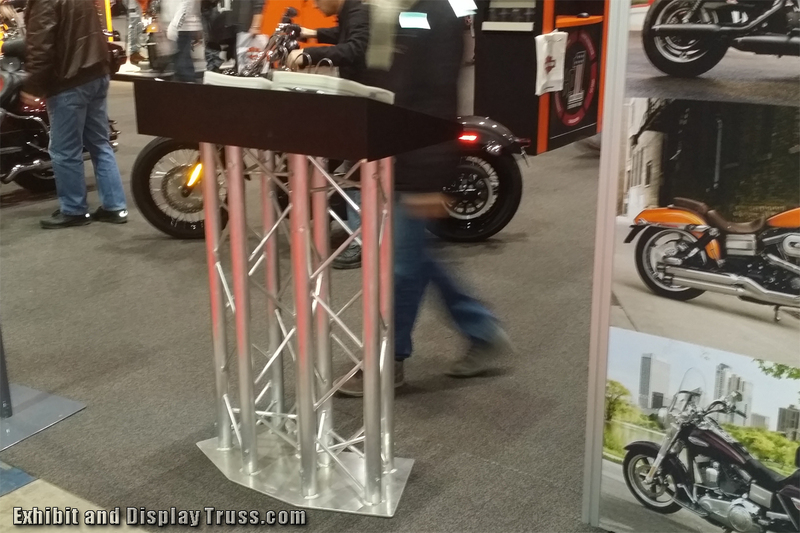 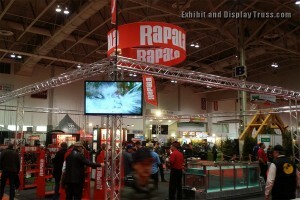 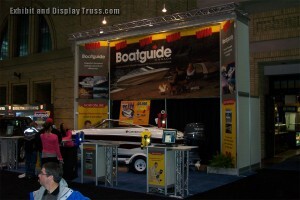 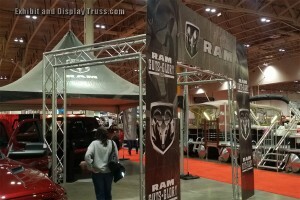 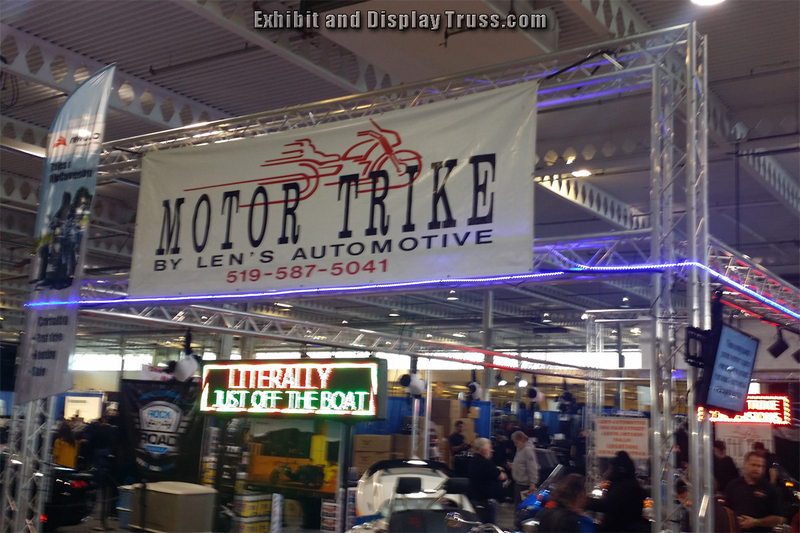 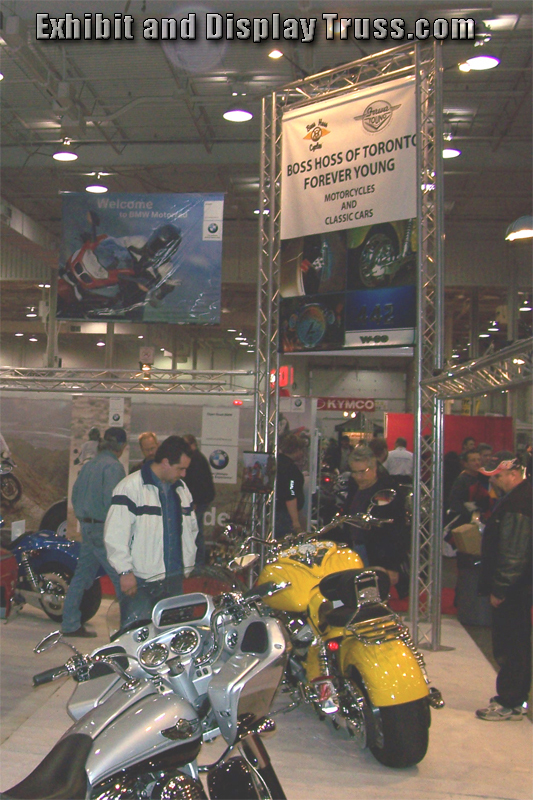 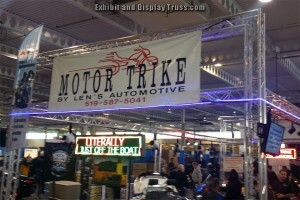 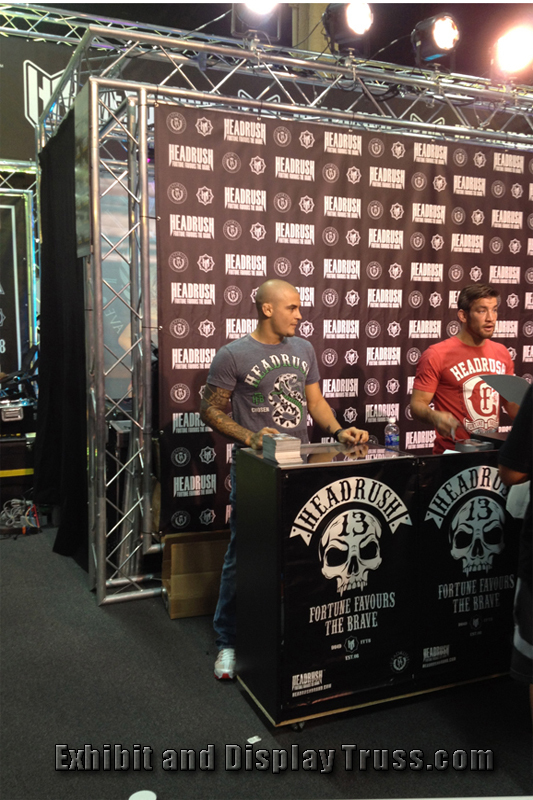 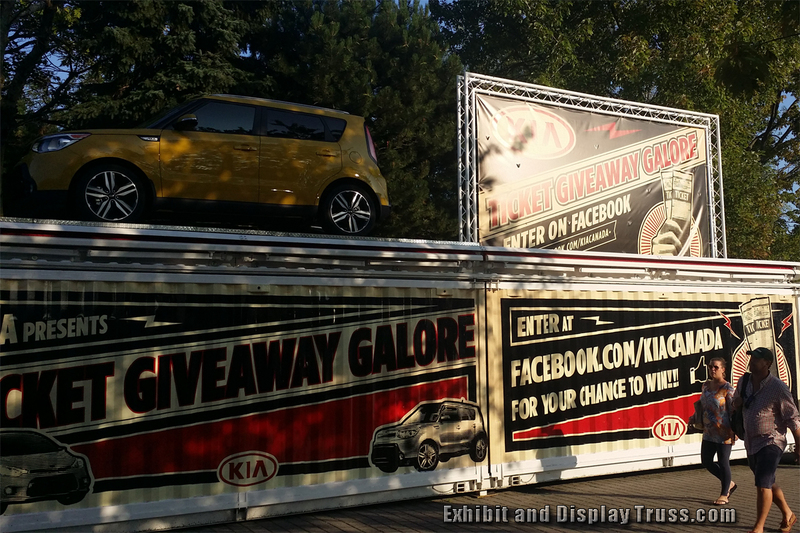 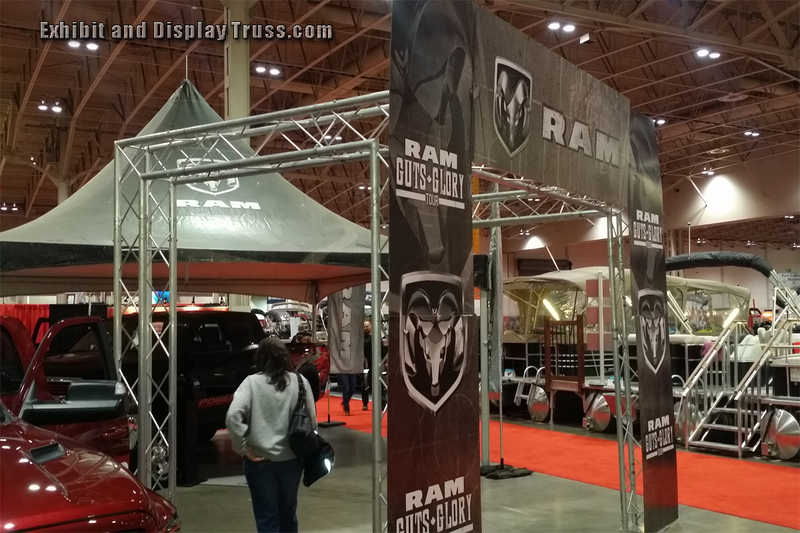 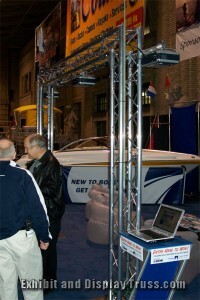 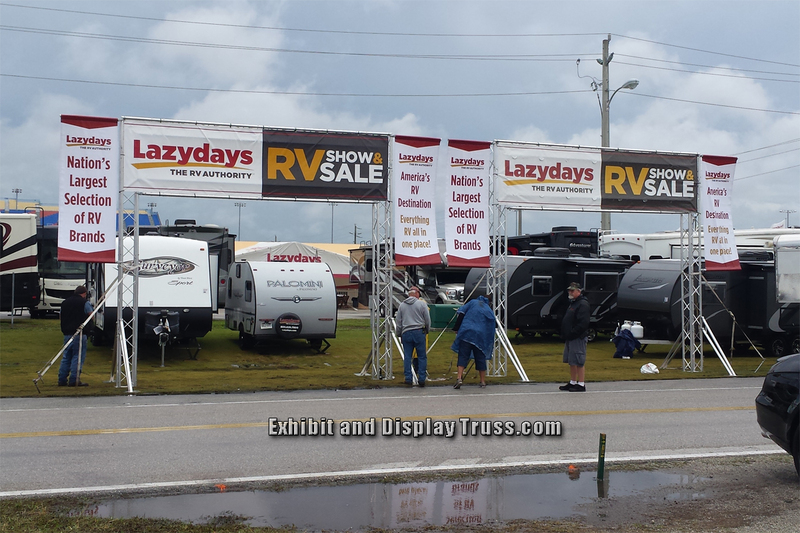 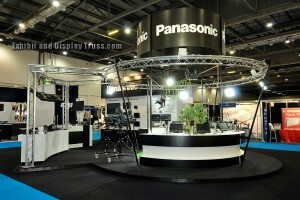 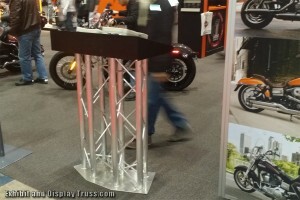 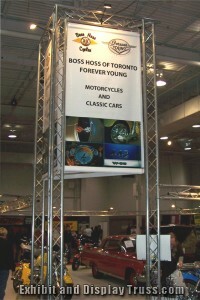 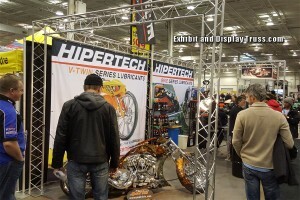 Steel truss is never a good option and is typically a poor choice for portable trade show displays. It rusts and it’s very heavy to work with. Don’t be fooled by flashy adds claiming “one stop shopping” or “everything you need” is in the box type adds. 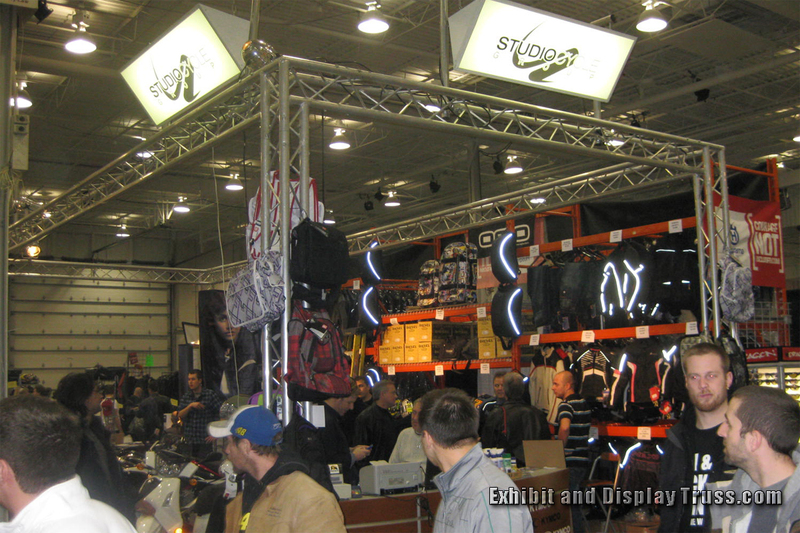 You will find that most of the time it’s a box full of sub standard items and products that don’t hold up or fail in just a few shows. 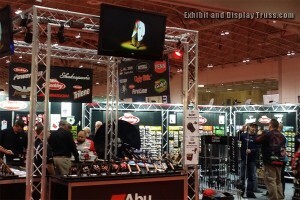 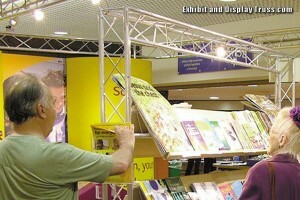 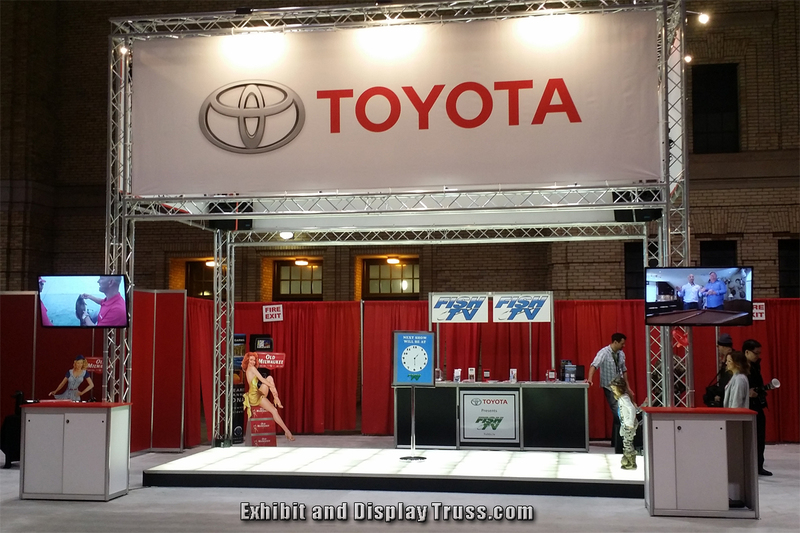 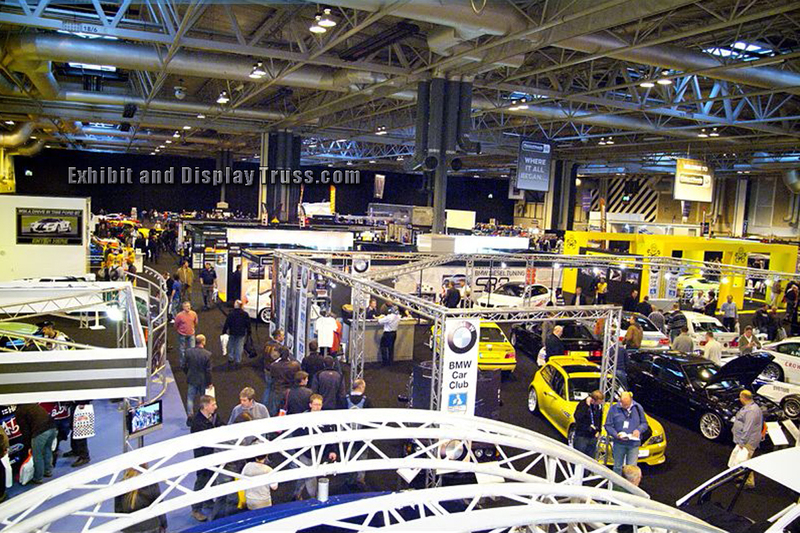 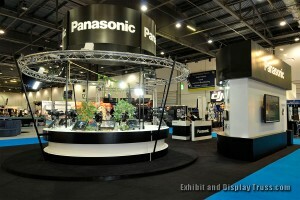 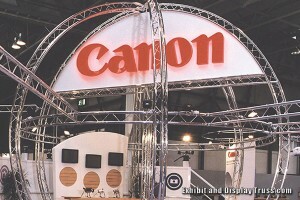 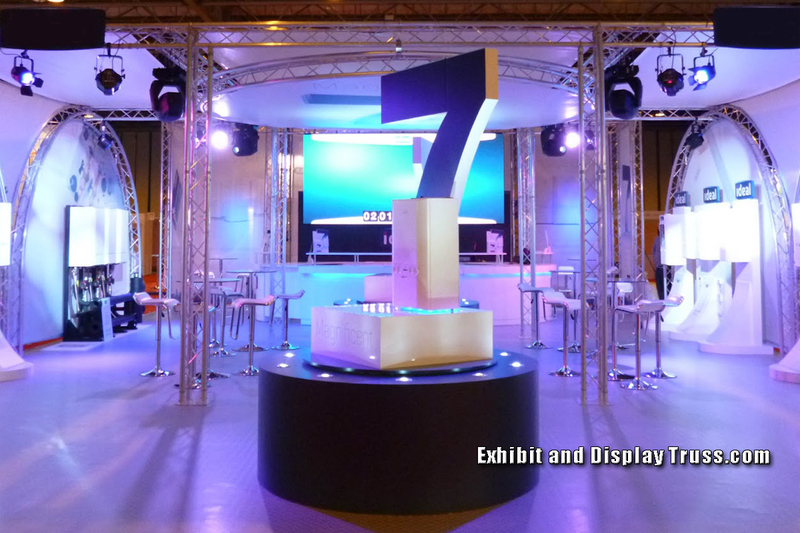 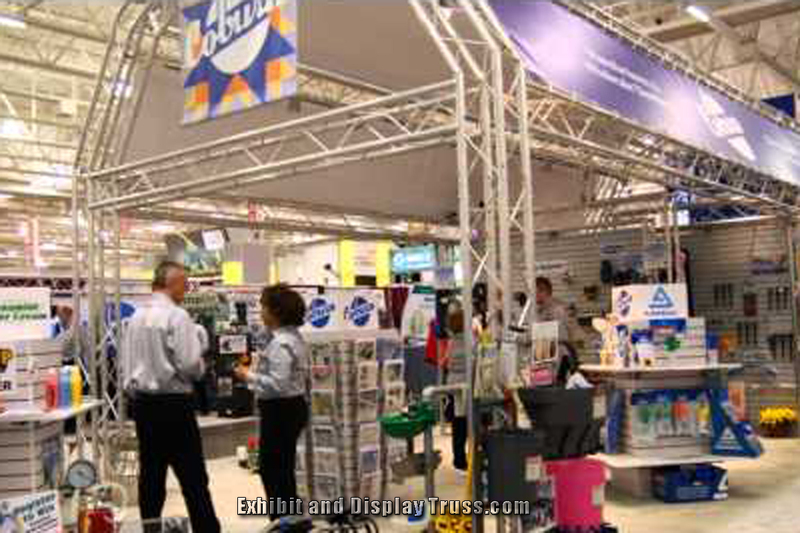 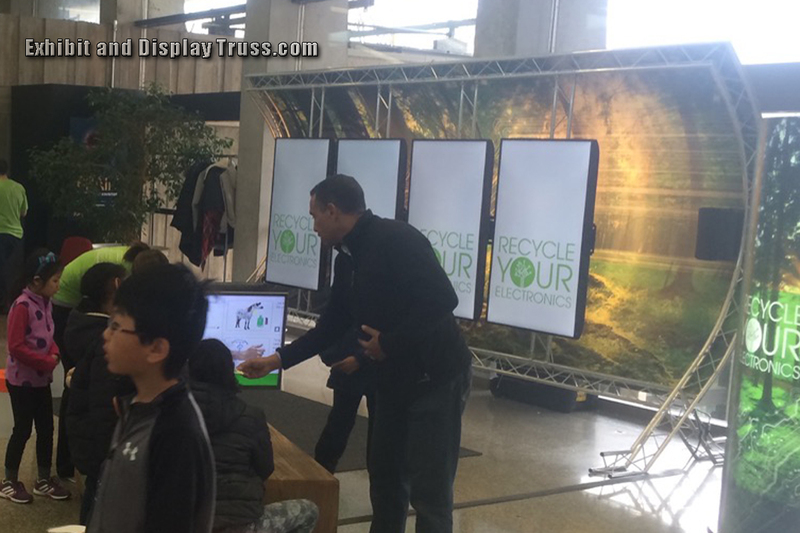 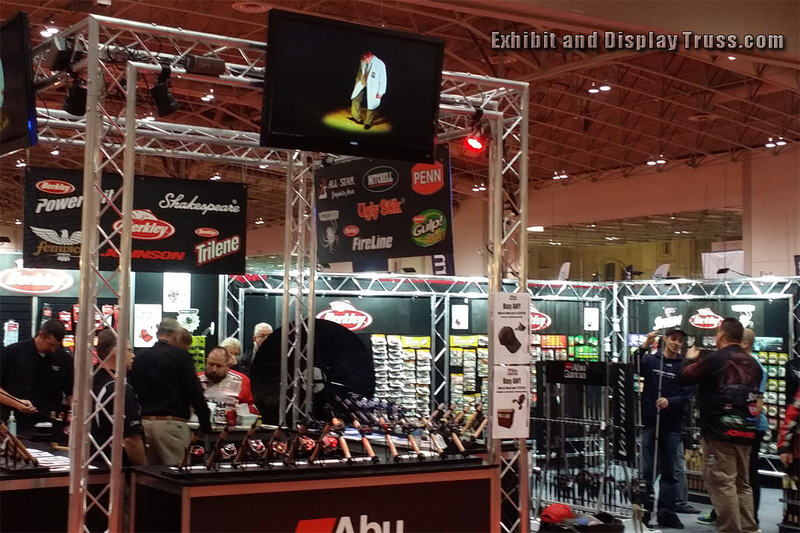 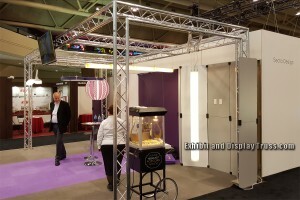 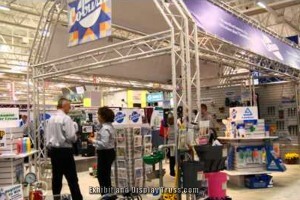 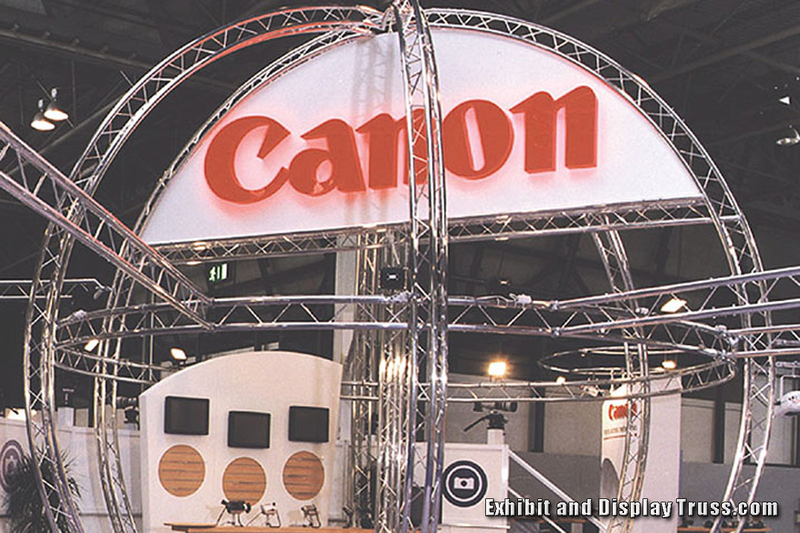 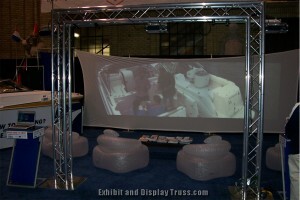 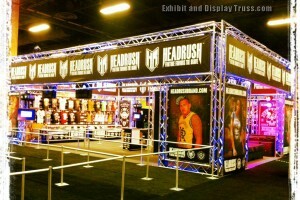 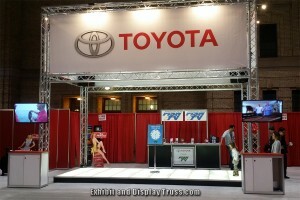 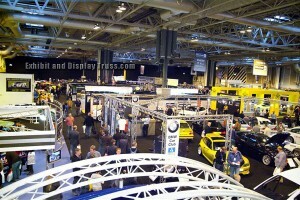 Buy Aluminum Truss Exhibition Displays or Exhibits for your Convention here. 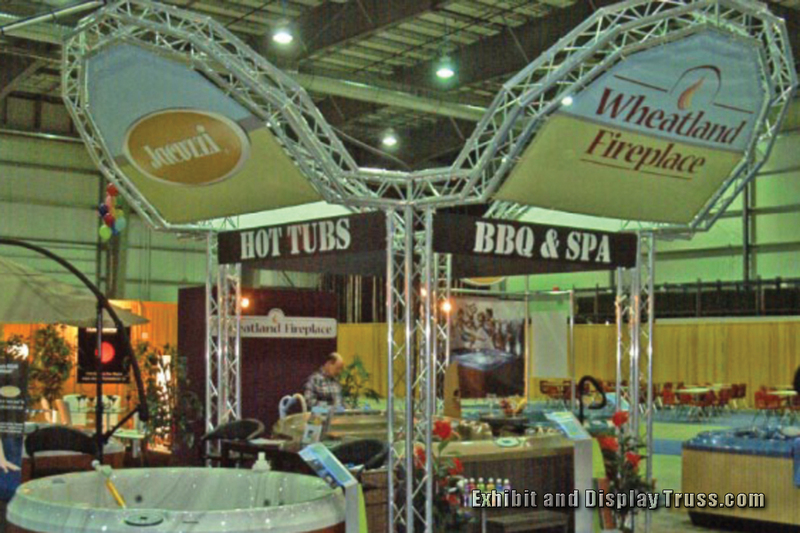 Please browse our photo gallery and take a look at some of the exciting and beautiful displays that our customers have designed and purchased. 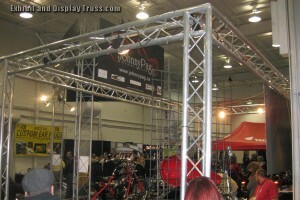 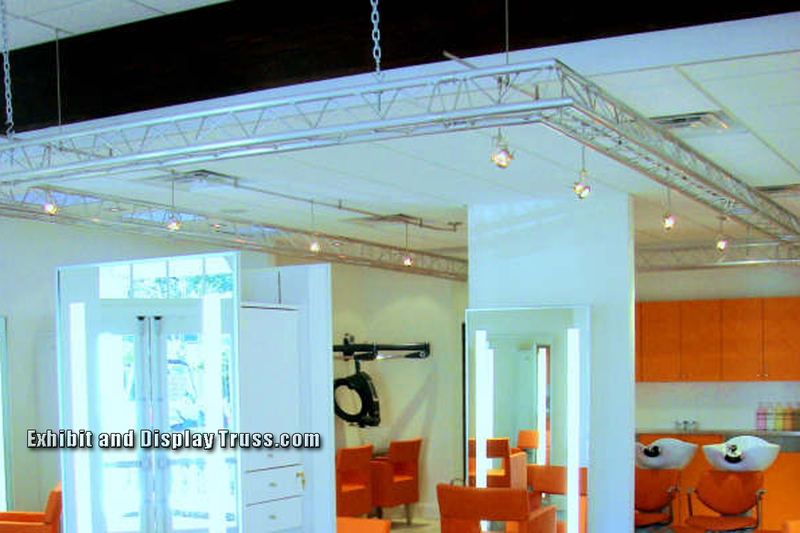 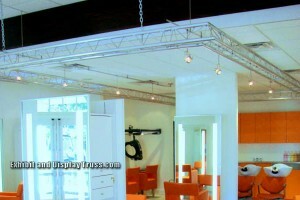 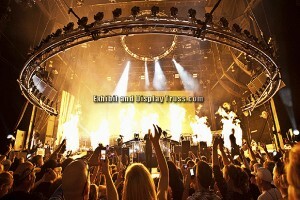 We fabricate displays of every size and shape and we always welcome custom truss fabrication projects. 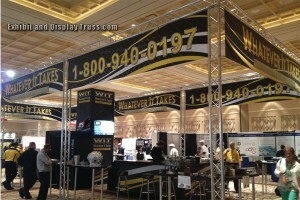 We here to help just let us know how. 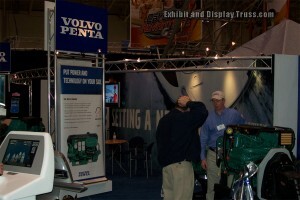 Nobody works harder to earn your trust and your business.